Drawing & Map 2-Face Inch Counter with Ring: Includes ring for compact pocket use and large diameter for easy readout. One side is fitted with a special dial for exact measurement of straight lines and curves on technical plans, drawings, blueprints, etc. While the pointer indicates traced distance in inches, the counter disk registers it in feet. 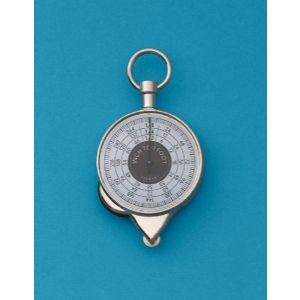 The second dial measures distances on maps or plans made to scales of ½", ¼", and 1/8" to a foot and counts the number of full pointer revolutions. Shipping Weight: .2 lbs.